Embraced by company-wide stakeholders, this foundation rises through the fresh produce department, revitalizes and reinvents the supply chain across a wider sphere — from innovative local farm sourcing networks and smart environmental footprints to ambitious food waste reduction and food recovery partnerships to elevate communities. The $300 million chainwide conversion plan will span across the company’s six-state territories. 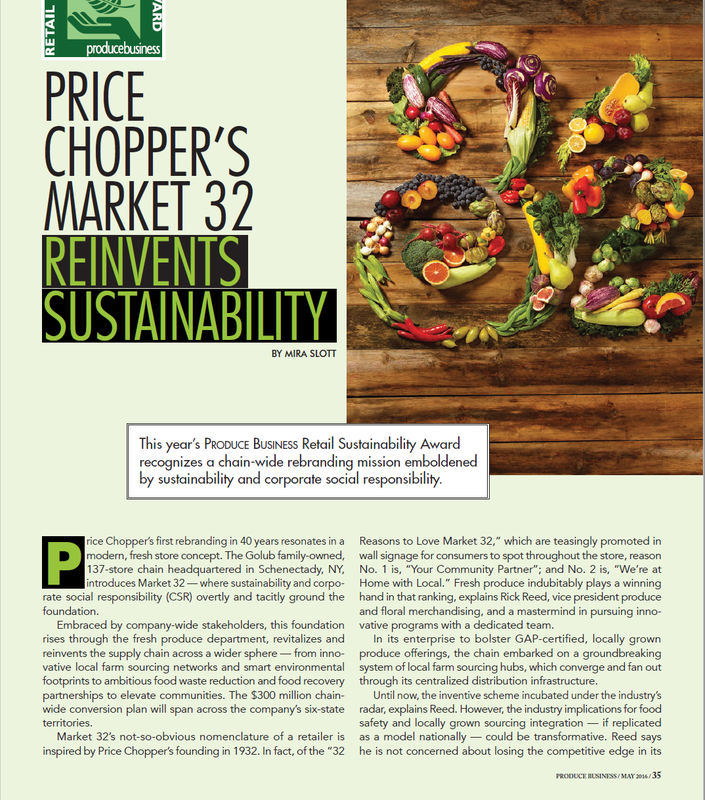 Market 32’s not-so-obvious nomenclature of a retailer is inspired by Price Chopper’s founding in 1932. In fact, of the “32 Reasons to Love Market 32,” which are teasingly promoted in wall signage for consumers to spot throughout the store, reason No. 1 is, “Your Community Partner”; and No. 2 is, “We’re at Home with Local.” Fresh produce indubitably plays a winning hand in that ranking, explains Rick Reed, vice president produce and floral merchandising, and a mastermind in pursuing innovative programs with a dedicated team. In its enterprise to bolster GAP-certified, locally grown produce offerings, the chain embarked on a groundbreaking system of local farm sourcing hubs, which converge and fan out through its centralized distribution infrastructure.